Transmitted and incident light in wooden box. Our sole proprietorship organization, Elshaddai Engineering Equipments came into existence in the year 2009 in Chennai, Tamil Nadu, India. We offer to our clients a vast range of our highly functional laboratory and testing equipments that are served to varied sectors. 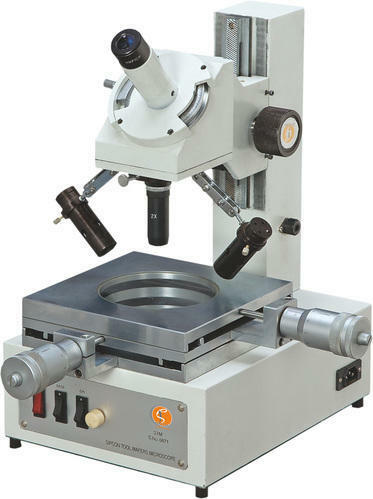 Our products range comprises of Aeronautics Lab Equipment, Automobile Lab Equipment, Electronics Laboratory Equipment, Welding Techniques, Lathe and Special Machine Shop, Electronics & Microprocessor Lab, Dynamic Lab Theory of Machines Equipment, Metrology Measurementation & Instrumentation Lab Equipment and many more. Our products of robust and sturdy construction are known for durability, abrasion and perfect finish, elegance and cost effectiveness. The high precision engineering products are manufactured from high grade raw materials ensuring long lasting life, trouble-free operations, compact designs, precise dimensions and above all meeting the international quality standards and as well as the complete satisfaction of the clientele. All our engineered items have been acclaimed to be best amongst clients.